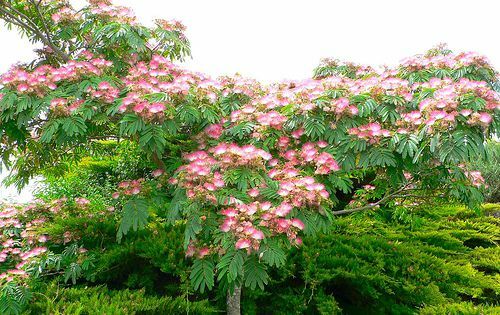 The pink siris is a tree that can grow to heights of 8 to 15 m, spreading out over 5 to 8 m. It is a very decorative tree. The pink siris (Albizia julibrissin), in the Fabaceae family, is also known as the silk tree. The crown of this tree is very spread out. Its bark is delicate, grey-green and then green, almost smooth, with whitish lenticels, and tends to form lengthwise streaks as it ages. Its deciduous leaves measure 30 to 40 cm long. Doubly composed, they are similar to fern leaves.They are light green in spring and summer, then yellow in the autumn. Its curious flowers are hermaphroditic, abundant and last a long time, from July to September, and consist of a round heart with long white and pink stamens. Its fruit are long hanging and pod-shaped from 10 to 12 cm long. This tree is from Eastern and Southern Asia, but its qualities have led botanists to spread it across all continents. This tree adapts to all types of soil. It enjoys full sun, but also slight partial shade. It does not tolerate waterlogged soil but, on the other hand, is reasonably drought tolerant. The pink siris is a good choice for ornamental purposes. Bees love its flowers, and therefore this tree can be very useful to bee-keepers.